Photographs have been released of a woman thought to have exposed herself to a car full of children in a West Midlands supermarket car park. Police said the woman approached the car in Smethwick and "became argumentative" with the female driver. She then unzipped her jacket revealing her naked body to the woman and her children, aged 13, 12, 10 and four. Sgt James Proffitt, from West Midlands Police, said it was the first time he had ever heard of "a lady flasher". "The crime is being treated as a serious sexual offence, which had left the children's mother shocked," he added. The 33-year-old victim took two photographs of the suspect when she ran away, which have been published by the police to try to identify her. The flasher is described as black and in her late 20s. Sgt Proffitt, said "The woman had no regard for the young children who were exposed to this kind of behaviour. 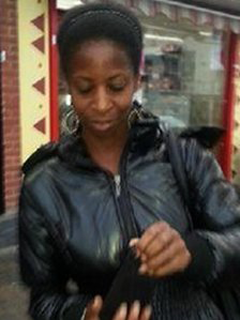 "This is a very serious crime and we would appeal to anyone who may know this woman to call us. "Why she did this still remains unclear and this is now an opportunity for her to contact us and explain." The incident happened at about 20:00 BST in the Asda supermarket car park in Cape Hill on 20 July.